Z-Phe-Tyr(tBu)-diazomethylketone is an irreversible cathepsin L inhibitor which is ca 10'000 times more effective in inactivating cathepsin L than cathepsin S.
Z-Gly-Leu-Phe-CMK is a cathepsin G inhibitor. Balicatib, an inhibitor of the osteoclastic enzyme cathepsin K.
Leupeptin is a reversible inhibitor of protease with Ki values of 35 nM, 3.4 μM, 6 nM and 72 nM for bovine trypsin, human plasmin, bovine spleen cathepsin B and recombinant human calpain, respectively. 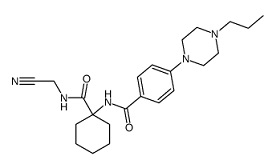 MDL 28170 is a selective inhibitor, which inhibites calpain with Ki values of 10nM and cathepsin B with Ki values of 25 nM while does not inhibit trypsin-like serine proteases. 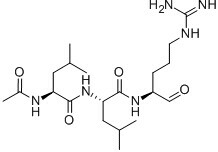 Odanacatib (MK 0822) is an inhibitor of cathepsin K with potential anti-osteoporotic activity. LY 3000328 is a potent and selective Cathepsin S (Cat S) inhibitor with IC50 of 7.7±5.85 nM and 1.67±1.17 nM for hCat S and mCat S.